Although delayed, the Telangana government notified the RERA rules and opted to implement the Central RERA norms with minimal changes. However, deferral in setting up an authority, launching the website and establishing an appellate tribunal left homebuyers wary, leading to subdued market sentiment. The 30-km-long metro service between Ameerpet and Miyapur (13 km), and Ameerpet and Nagole (17 km) is set to be operational by November 2017. Built at a cost of Rs 15,000 crore, the project is anticipated to cut travel time between Nagole and Miyapur from 90 minutes to 45 minutes and thereby boost real estate demand. The State government has planned a facelift for Hyderabad by undertaking several flyover projects between areas such as JBS-Thumkunta, Paradise-Kompally, Amberpet chowrasta- Uppal and Uppal-Ghatsekar. Hyderabad’s realty is set to gain from the recently proposed 1,100 km Nagpur-Hyderabad- Bangalore Expressway that will pass through Maharashtra, Telangana, Andhra Pradesh, and Karnataka. 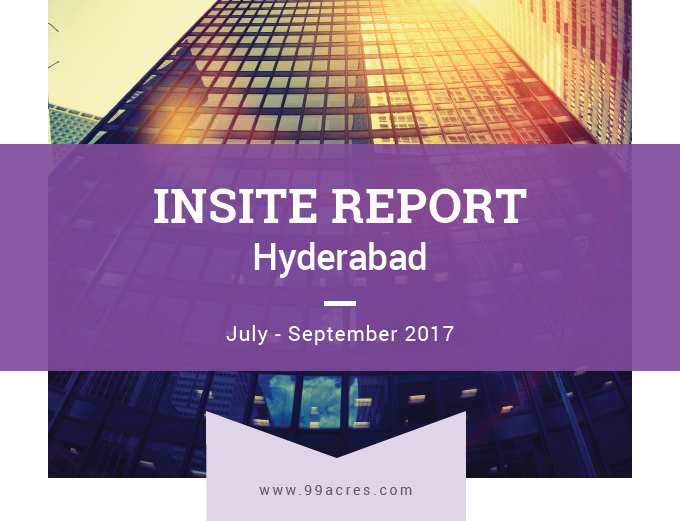 Hyderabad holds 67 percent of the REIT-worthy office properties across Telangana. This places healthy investment potential in the city. Hyderabad braved the tide of uncertainty and economic upheavals – national and state-level – to emerge as the only metro posting an upswing in both capital and rental housing markets. The city had its own share of provincial concerns including the infamous Miyapur land scam and the State’s inability to meet the initial deadlines for the launch of the RERA website and a regulatory authority to monitor the same. Nevertheless, average weighted capital ‘asks’ and rental rates did not succumb to pressure due to ample availability of affordable housing inventory and an unceasing charm for luxury properties. While new launches numbered bare minimum, supply figures were not hit as owners started entering the resale market three quarters post the momentous demonetisation move last year. Enquiries improved across budget segments, although conversion ratio was meek. The purchasing cycle in the city has doubled in the last three quarters to reach 6-7 months now. Despite a healthy home ownership appetite, a major share of the prospective buyers are taking a cautious stance owing to multiple policy reforms. A functional RERA website and more transparency is expected to shorten the purchase cycle to a quarter by Q1 2018. The Jul-Sep 2017 quarter saw average weighted capital values in Hyderabad recording a two percent rise, QoQ, while the rental market continued to remain upbeat, posting a five percent appreciation in rental ‘asks’, YoY. The peripheral pockets in the West garnered maximum housing demand owing to their strategic location, affordable rentals and proximity to the IT hub. Post the implementation of RERA and GST, the city’s realty market saw an upsurge in enquiries, particularly in the high-income housing segment on account of improved buyer confidence. Despite this, conversions remained low since cautious homebuyers sought more clarity on the reforms and adopted a wait and watch approach. The premium housing hub of Hyderabad – Banjara Hills - continued to do well and emerged as the frontrunner witnessing a six percent growth in average capital values, QoQ. Geographic edge, proximity to IT hubs and well-developed social infrastructure added to the attractiveness index of the region. Newly emerging micro-markets of Pragati Nagar, Appa Junction and LB Nagar drew demand from end-users on the back of affordability, sound connectivity, and nearness to employment hubs. The upcoming metro between Miyapur and LB Nagar served as the cherry on the cake. These localities recorded a capital appreciation to the tune of four and five percent, QoQ, respectively. 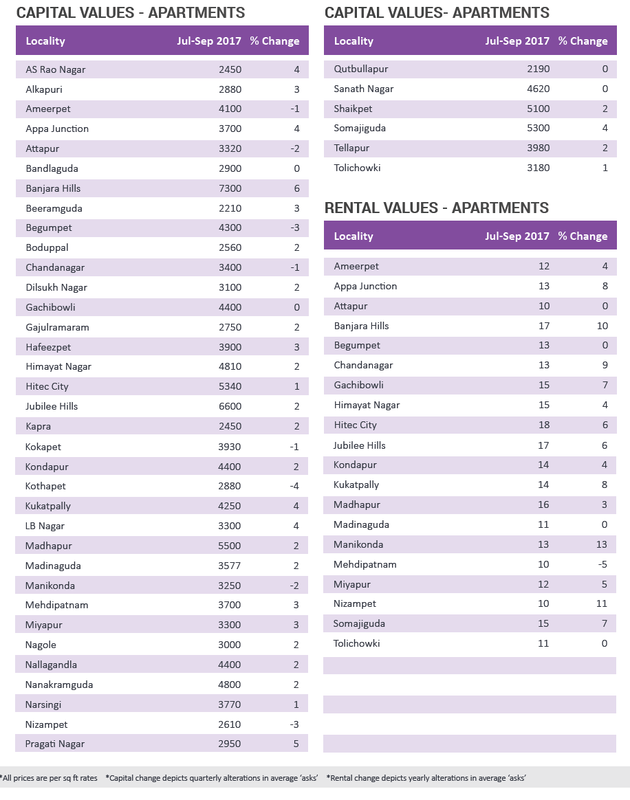 Despite stable housing demand, West Hyderabad’s rental market continued to outshine the rest of the city with eminent localities such as Manikonda, Nizampet and Banjara Hills observing maximum movement in residential leasing values. Prospective homebuyers held their purchase decisions, which benefitted the rental market. 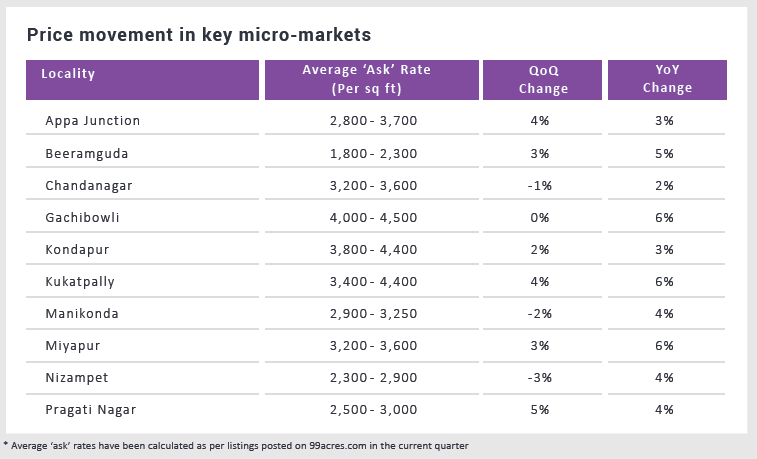 These localities observed an upsurge of 10-13 percent, in rental ‘asks’, YoY. In tandem with other metros, new launches in Hyderabad were shelved due to ambiguity over RERA and GST. Delay in the launch of States’ RERA website and establishment of an appellate tribunal further left developers baffled and market uncertain. A revival in sales is anticipated in the upcoming festive season when several developer are upbeat about offering discounts and freebies on home purchase. Robust absorption of commercial office spaces is also expected to spike housing demand in the city in the forthcoming quarters. Despite new launches witnessing a halt in Jul-Sep 2017, the city noticed increased demand-supply mismatch as homeowners made desperate attempts to liquidate their real estate assets. Delay in setting up of RERA website dampened the sentiments of first-time homebuyers, thus, restricting sales across all budget categories. While fresh residential supply took a backseat owing to RERA conformities, commercial segment is set to see an upswing in the forthcoming quarters owing to its better investment prospects. Demand for apartments in Hyderabad remained subdued in anticipation of clarity over RERA and GST. The detrimental impact of the massive Miyapur land scam, which was unearthed in the last quarter continued to plague the real estate market. Despite the absence of new launches, the overall supply of apartments rose by 26 percent due to an upsurge in the resale inventory, most of which belonged to the Rs 40-60 lakh price bracket. This led to an increase in supply from 20 percent in Apr-Jun 2017 to 28 percent in Jul-Sep 2017. 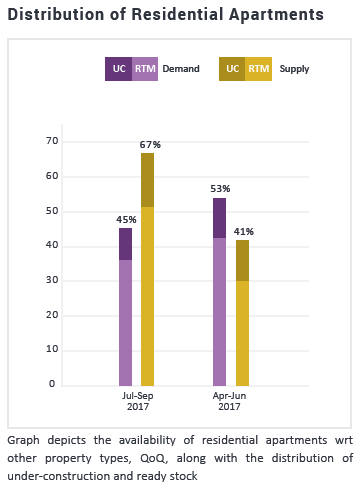 Supply of affordable housing units saw a steep decline this quarter, leading to a demand-supply gap of 26 percent. This is largely owing to developers pulling back properties from sale in the wake of inadequate clearances, as required under RERA. Inventory overhang in luxury segment remained the highest, accentuating the frail traction that this housing segment receives from buyers. Most of the enquiries received in the high-income and luxury segments are set to translate into sales in the forthcoming quarters, especially in the festive season.